Two of crossover music’s iconic cult acts are uniting for an upcoming campaign of musical destruction later this month in The Lone Star State. 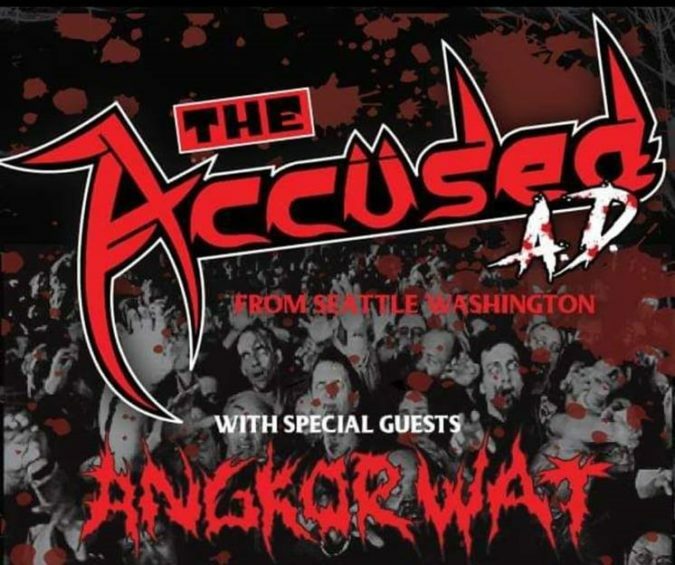 Yes, that is when Seattle’s splatterpunk thrash metal gods THE ACCUSED A.D. will unleash a short run of live assaults in Texas, supported by the reactivated ANGKOR WAT. The five date trek (listed below) will launch in Houston on December 12th and wrap up in Austin on the 16th. THE ACCUSED A.D. are the modern incarnation of this horror-fueled band, one whose musical legacy stretches back to the Pacific Northwestern U.S. in the early 1980’s. Closing in on four decades of insanely chaotic, punk powered metal, the legacy this band embodies is one that is held in high regard by music fans from the old school to the new. Then there is Texas’ own ANGKOR WAT, also an act with a long history at their heels, one that is regarded as a pioneering band in mashing genres into their own unique sound. If you somehow missed it, ANGKOR WAT were the subject of a recent Riff Relevant Oldschool Sunday segment [HERE]. Here is the tour itinerary along with a video trailer announcing this must-see live excursion from these two iconic bands.